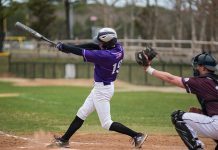 The Martha’s Vineyard Sharks of the wooden bat Futures Collegiate Baseball League open their second season today at 6 pm in Rochester, N.H., against the Seacoast Mavericks. The Sharks play at Brockton tomorrow and open the home schedule on Saturday at Vineyard Baseball Park against the Nashua Silver Stars. Game time is 5 pm. Sunday, the Sharks will host an exhibition game at 5 pm against a team of United States military All-Stars. Sharks tickets are $5 for adults and $3 for children (13 and under). For more information, visit mvsharks.com. The South Coast Soccer League wrapped up regular season play over the weekend, with all of the MV United teams in action. The Under-10 boys scored a huge away win in Nantucket to finish with four wins, two losses, and two draws. Robe Della Torre scored four goals, Ben Taylor tallied thrice, Moushe Oliveira and Morgan Estrella notched a pair apiece, and Cary More-Straton and Peter Burke added a goal each in a 13-2 rout. The U-15 boys (7-1-0) whitewashed visiting Bourne, 12-0. Coach Esteban Aranzabe’s team outscored its opponents by a robust 73-2 in eight matches, but simply couldn’t find the onion bag in a 1-0 loss against regular season champs Dartmouth back on April 22. The U-18 boys improved to 6-1-1 with a 6-2 away win over Freetown-Lakeville. The U-11 boys (1-4-3) played twice at home over the weekend, losing 5-3 to Dartmouth, Saturday, and tying Barnstable, 1-1, on Sunday. The U-12 boys (2-5-1) dropped a 4-2 decision to host Fall River. In girls action, the U-16s (1-3-4) traveled to Dighton-Rehoboth and lost, 3-0. The U-14s (1-5-2) hosted Falmouth at Veterans Park and lost to the Clippers, 3-0. The U-12s (1-7-0) lost at Yarmouth-Dennis, 5-0. The YMCA of Martha’s Vineyard will host its first Special Olympics swim meet on Friday from 5:30 to 7 pm. The first place Cubs (12-1) blanked the Tigers, 10-0, on Monday, in an abbreviated game at Veira Park. Aidan Aliberti threw four perfect innings to earn the win. The second-year tandem of Zack Moreis and Lucas Debettencourt combined for five hits and seven RBI’s to provide the pop at the plate. Eleven-year-old Tiger Hollis Kelly had the most memorable at bat of the evening by fouling off seven straight pitches. Friday, the Cubbies downed the Athletics, 7-1. Lucas Debettencourt stifled the A’s offense, allowing one hit and striking out 10 over 4 1/3 innings, as the Cubs improved to 11-1 on the season. Taber Caron and Aidan Aliberti (four RBIs) led the Cubs offense with three hits apiece. Colby Scarsella had two hits for the A’s. Sunday, the second-place Astros beat the third-place Old Rochester Indians, 6-5, in nine innings, (seven is regulation) at Vineyard Baseball Park. With the win, the ‘Stros (10-2-1) moved into a tie for first with rival Dennis-Yarmouth. The Astros won the game in the bottom of the ninth when Cameron Maciel hit a grounder to score Jacob Cardoza, who had reached third with a single and two stolen bases. Maciel and Jonas Lukowitz hit four RBIs to pace the Astros to a 5-0 lead in the fourth. The Indians came charging back with five runs in the top of the 5th. Aksel Cooperrider was solid on the mound for the ‘Stros. Tristan Araujo made several key plays at second base and was the defensive player of the game. The Holmes Hole Sailing Association (HHSA) announced its schedule of handicap racing from Vineyard Haven Harbor for the 2012 summer season. 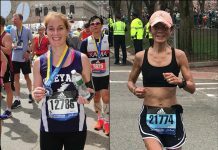 HHSA will sponsor a series of 27 races, in a variety of formats, commencing with a tune-up race in Vineyard or Nantucket Sound on June 17 and concluding with the annual George Moffett Memorial Race on September 8, 2012. Handicap racing is designed to allow a wide variety of different boats to compete fairly through a system of time allowances. 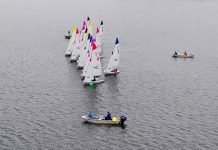 The HHSA is a collegial group of local skippers that has been sponsoring these races since 1970 with a goal of providing fun competition, with the emphasis on fun. The weekly races are divided into four categories; Harbor, Sound, and Rendezvous races which are run on Sunday, and 11 Thursday night races, which are at 6 pm on Thursdays. The Thursday sailors convene at the Vineyard Haven Yacht Club after the races for a burger and race results. The Harbor races are run on three courses in or just outside of the Harbor, using primarily navigation buoys as marks. There are two races on each of the scheduled dates, at 10 am and 2 pm. This year, there are four scheduled — on June 24, July 8, August 5, and September 26. The Sound races are longer races that are run on three courses that start and finish in Vineyard Haven Harbor. The courses take the fleet out into Vineyard and Nantucket Sounds. They commence at noon, on July 1, July 29, and August 19. The Moffett Race, a highlight of the season, is September 8. In addition to the Association schedule, the club hopes to field a large fleet to compete in the Vineyard Cup, the exciting event planned by Sail Martha’s Vineyard, scheduled for the weekend of July 13 to 15. The HHSA actively seeks new participants. Log on to the website at holmeshole.org where race circulars, rules and entry information may be found. The Euro 2012 soccer tournament, hosted by Poland and Ukraine, begins tomorrow in Warsaw at 6 pm (12 pm Eastern time). Local fans will find ample viewing opportunities on the Island. The tournament runs until July 1, when the final will be played in Kiev. Coop de Ville, on the Oak Bluffs harborfront, long the Island’s unquestioned soccer hotbed, will air all 31 matches. Fans may also catch all the action at Season’s Eatery and Pub, the Lookout Tavern, Sharky’s in Oak Bluffs and Edgartown, and the Martha’s Vineyard Chowder Company. The quadrennial tournament features 16 of the top European national squads and is one of the sport’s marquee events. The tournament is expected to attract 150 million viewers per match worldwide. ESPN will broadcast the matches in the USA. The 2008 European Championship, played in Switzerland and Austria, drew large, enthusiastic crowds at the Coop, Season’s, and Sharky’s. The exploits of Portugal, England, and Ireland in this year’s event will likely be followed on the Island with keen interest. For the latest information and to view the match schedule, visit soccernet.go.espn.com or uefa.com. Martha’s Vineyard Girls Youth Lacrosse traveled to Falmouth last Sunday. The U-15s played to a 5-5 tie. Erin Hill notched a hat trick and K.C. Wallace scored twice. Kylie Hatt played well between the pipes for the Vineyard. The U-13s played a tough Falmouth team and lost, 11-5. Addy Hayman had a hat trick; Audrey McCarron and Julia Regan each scored once. Goalies Kazara Aldeborgh and Hailey Meader combined to stop ten shots. The girls play their final home game of the season this Sunday at the high school field. Five juniors travelled to Rhode Island last weekend to play in their first USTA tournament. Coach Michael Halisky chaperoned as did several parents. Camilla Prata won her flight in the 12 & Under girls division with Alexis Condon and Warner Hess also participating in her group. Jack Creighton, David Krauthamer, and James Kelliher all gave 100 percent but came up short in their groupings. Overall, it was a great trip and exposed the juniors as to what it is like on the USTA junior circuit. Parent Child TournamentVineyard Youth Tennis will be hosting a parent child tennis tournament from June 23-24th. Entries are now available at VYT and feature the following divisions: Father-Child 12 & under; Father-Child 14 & under; Mother-Child 12 & under; and Mother-Child 14 & under. Cost is $30.00 per team and each individual will receive a T-shirt. Winners of each division will have a chance to advance to the regional finals at the Family Classic held at New Haven. The Early Bird Doubles to benefit the Fish Farm for Haiti Project will take place from Friday, June 22nd to Sunday, June 24th. The tournament is open to players of all ages. All entry fees go directly to the Martha’s Vineyard Fish Farm for Haiti Project. Play will be set up in two divisions: A Division – Open to all players, in men’s, women’s, and mixed doubles and B Division – NTRP 3.5 and 3.0, also in men’s women’s, and mixed doubles.All players are guaranteed at least 2 matches per event entered. First-match losers will be placed into Consolation Draws. The entry fee is $50 per player for each event entered payable to Fish Farm for Haiti Project. Matches will be played at Farm Neck Tennis, Oak Bluffs, MA. Other sites may be used at the discretion of the tournament committee. First round matches will start on Friday, June 22nd at 3pm. All players must be available to play at least one match on Friday. Finals are scheduled to be played on Sunday, June 24th starting at 10:00 AM but is subject to change. Entries will close at 6pm, Monday, June 18th. The format will be single elimination, regular scoring, best two out of three sets with a Match Tiebreak in lieu of a third set. Based on the number of entries for a particular event, the format may be changed to a Round Robin. If there are an insufficient number of entries for any event, the event may be cancelled by the tournament committee. All entries must be submitted by 6pm, Monday, June 18th. Start times and draws will be posted at www.TennisMV.com on Wednesday evening, June 20th.Full information about this tournament, to submit entries and dates of future tournaments are available at www.TennisMV.com. Farm Neck Golf Club hosted the 18th annual Children’s Benefit Golf Tournament on Sunday. The event raised over $38,000 to support the affordable programs of the Martha’s Vineyard Boys and Girls Club and Big Brothers Big Sisters of Martha’s Vineyard. Morton Financial was the tournament sponsor. Edgartown National Bank and Vineyard Vines were major sponsors. The quintet of Ann Heron, Tom Prendergrast, Connie O’ Dougherty, Norman Vunk, and Payton Wallace came in first with a score of 52.5. Donald McGrath, Lee Guittar, Rich Peterson, Richie Yuen, and Mike Holenko were second. Joann Mettler, Matt Marchand, Parker Crowell, Asa French, and John Sullivan took third.